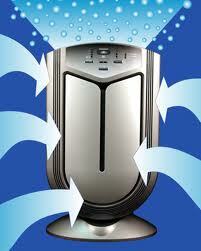 Ultra Quiet 5-Speed Fan - Effectively moves and cleanses the air in all indoor household and office environments. Can be set to high, medium, low, ultraquiet and automatic operation. 1. Air Pollution Sensors - Monitor indoor pollution levels and adjust system performance settings to maximize air cleansing effectiveness. 2. Diagnostic Sensors - Alert you when it's time to replace filters, the UV light or clean the collector grid all designed to guaranty your system is working at peak performance. 3. Washable Pre-Filter - Removes large airborne particles, allows the other filters to work more effectively and extends the overall life of your air purification/filtration system. 4.Washable Electrostatic Dust Collector Plates The electrostatically-charged dust collector grid traps tobacco smoke, pollen, dust, pet dander and other harmful airborne particles and pollutants like a magnet. 5. Activated Carbon Filter - Far and away the most effective filter for absorbing odors, toxic gases and hazardous chemical fumes including cigarette smoke and everything from paint fumes and toilet odors to poison gases. 6. 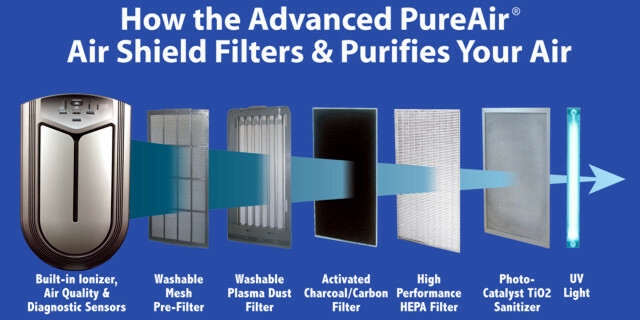 High-Performance HEPA Filter - A must have technology for those suffering from allergies and asthma, this filter is tested 99.97% effective in capturing harmful airborne particles as small as 0.3 microns including dust, pollen, bacteria as well as other harmful airborne germs and pollutants. 7. Ultraviolet (UV) Light Irradiation - Recommended by the Centers of Disease Control and numerous other government and private agencies, ultraviolet light actually breaks down the molecular structure of mold, bacteria, viruses and other airborne germs rendering them harmless. 8. Dual Photo Catalyst Nano-TiO2 Germicidal Sanitizers - Help suppress the growth of harmful microorganisms including mold, mildew, other household fungi, bacteria, viruses, dust mites and a variety of odors. 9. Anion Continuous Negative Ion Generation - Helps put back the naturally occurring, healthy air cleansing properties of negative ions that urban living steals from mother nature. Extremely effective at clearing smoke, decreasing carbon monoxide levels, combating airborne infections and even reducing fatigue. 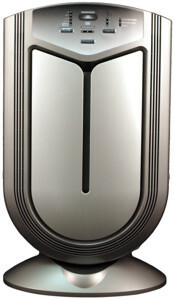 Multiple Air Inlets Design - Maximizes air flow through the unit. 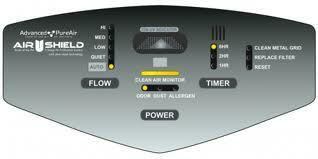 Automated System Mode - Automatically adjust air purifier operational settings based on air quality. If the air quality is sufficiently clean the system drops into the lowest operational setting quiet mode to save electricity but if the air quality worsens, the system automatically shifts into progressively higher settings to keep your room air fresh and clean. any home or office decor.